As a business owner, how valuable is your time? What if you had more time to concentrate on building your business and increasing existing sales? Think of the possibilities! HR Outsource & Staffing's Payroll Administration and Staffing Services can give you that time. We offer practical solutions for Staffing your business and for outsourcing Human Resource Functions such as Payroll and Bookkeeping activities. Have more work than you have personnel to do that work? 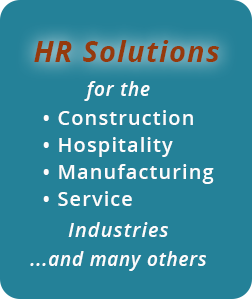 Let HR Outsource & Staffing fill all of your supplemental workforce needs. We have a proven track record of providing "The Right Person for the Right Job." You no longer need to fear the unknown, or spend countless hours reading new rules and regulations to try and understand what you have to do to comply. Our Integrated HR Solutions makes handling all of your HR administration tasks worry-free. Whether it's handling time-consuming issues such as weekly payroll and payroll-tax administration, unemployment claims and workplace injury management, or more complex issues such as Federal and State regulatory compliance issues, We Have You Covered . We can become a virtual extension of your business. A reliable and cost effective way to handle necessary business tasks. And our "No Hidden Cost—Ever" policy guarantees that you are never surprised. Copyright 2018. HR Outsource & Staffing, LLC. All rights reserved.